Gov. Peter Shumlin is getting remarried. The 59-year-old Democrat, who is not seeking reelection next year, confirmed in a statement Thursday that he and longtime girlfriend Katie Hunt recently got engaged and plan to marry within the next year. "I feel so lucky to have Katie in my life, and we are very happy to share this news," Gov. Shumlin said in the statement, which came in response to reporters' questions. Shumlin and his first wife, Deborah Halway, divorced in April 2013 after a long separation. They have two grown daughters. Shumlin and Hunt have been increasingly public about their relationship in recent months. She attended — and was publicly acknowledged at — his inauguration ceremony in January and has accompanied him to numerous public events. Gov. 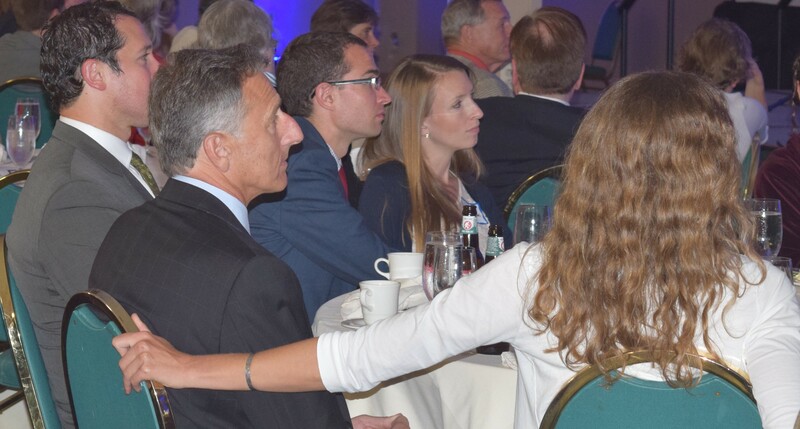 Peter Shumlin with girlfriend Katie Hunt at the Democratic Party Curtis Award dinner in June. Shumlin, who built a house in East Montpelier after he took office, said he and Hunt plan to return to Westminster West, near his native Putney, when he finishes his term as governor in January 2017. Hunt is an artist, landscape gardener and student at Mount Holyoke College. She is 31. "Peter is my best friend and the love of my life," Hunt said in the statement. "I could not be happier to continue on together living in the state we both grew up in and love so much."